I'm delighted to be joining Something Completely Different this month as guest designer for July - thanks for the invitation SCD! We're making tags this month and the first theme is.... hearts! The bee was stamped on vellum and cut out and then stamped again on plain white card and just the body cut out and stuck on top of the vellum so his wings are semi transparent. I used the Wild Honey ink to colour him. I stamped the head part onto the cut out heart so that his legs and antennae show there rather than trying to cut round them! I stamped the sentiment straight onto the tag and then stamped again on white cardstock and cut around the "dymo label" words and stuck them over the top. A little bit of doodling and a silk ribbon through the top finishes it off. Love the tag, perfect colours and images. That's a real cute tag! What a sweet little tag - and i love the colours. Wonderful tag!I love the bee stamp and the honey colours. I never thought you'd be on the DT when you had so much trouble last week! Maybe tags are a better bet for you! This one is lovely, the little honeycomb heart is so sweet (no pun intended) I'll see if I can make something this weekend. Very fab design, love it ! 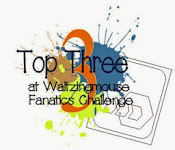 Lost track of you as we do not see you on Tanda these days so extra excited that you are a GDT on one of my fav challenge blogs this month. Hard to believe you found the theme of hearts difficult it is a stunning piece. Gorgeous tag Joanne - love the colour and that bee is wonderful! 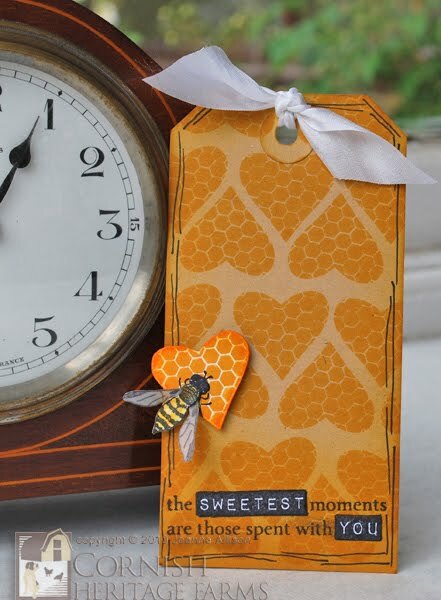 this is such a lovely tag and a great way to do the bee!